A couple of weeks ago my new copy of The Greens Cookbook arrived. My original copy was a small paperback version that I bought in London in 1997. That little book turned out to be invaluable to me. Not only because I was working for a family and was responsible for making dinner every night. But because it had tables converting American measures, temperatures and ingredients into British. At that time I had no idea that an eggplant was an aubergine or that zucchini was courgette. When I went to South Africa for a year following London, that little paperback came with me. It turned out to be a great resource in South Africa as well since their English and measures are British. So that little book had been through quite a lot, and was starting to fall apart. The Greens Cookbook is an incredibly special book to me. It is chock full of great recipes, including a sesame noodle recipe that is my potluck standby. But the reason that it holds such a special place for me is because it is representative of the first year that Louis and I spent together. We met at a youth hostel in Paris and a couple of months later, I went to London to be with him. We were only able to see each other on weekends because he was working in South London and I was in Northern London. A few months later he went back home to South Africa to finish his final year of college, and I went with him. It was great to finally be together in our own space. Louis was studying to be an engineer and was studying all the time. We had no T.V., no radio, no computer. My only source of entertainment was when Louis would take breaks from the books to serenade me with his guitar. It was actually pretty great. I would spend the majority of the evening cooking. One of the things that I made most frequently was foccacia bread. I made many kinds of foccacia, but one of my favorites was also the most simple. The dough is topped with sliced onion that has been tossed with olive oil and some thyme or rosemary and salt. The onions become soft in some areas and crispy and caramelized in others. It is the perfect accompaniment to a bowl of soup. So when the new hardbound Greens Cookbook arrived, I began flipping through it. It was like reminiscing with old friends that I hadn't seen in a while. My eyes became transfixed on one particular recipe, Turnip Soup with Turnip Greens. I hadn't even known that recipe was in there! And it was just the perfect thing because I had a bunch of turnips in the fridge and the weather had turned cold. So it was time to make soup and foccacia bread and remember our days in Cape Town. This soup is delicious. Milk is used as the broth, so it is creamy without being heavy. The turnips are blanched to remove any bitterness, and they become sweet stewed with the leeks and milk. I just love that this recipe uses the turnip and its greens. 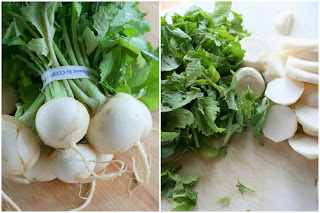 The sharpness of the greens is a lovely counterpoint to the sweet turnips. Peel the turnips (thickly, if they are large and mature) and slice them into rounds about 1/4 inch thick. Bring 3 quarts of water to a boil; then add 2 teaspoons salt and the turnips. Cover the pot and cook for 1 minute; then drain. Melt 3 tablespoons of the butter in a soup pot with 1/2 cup water. Add the leeks, the blanched turnips, the thyme, and 1 teaspoon salt. Stew them, covered, over medium low heat for 5 minutes, and then add the milk. Slowly heat it without bringing it to a boil, and cook, stirring occasionally, until the turnips are completely tender. Cool the soup briefly; then puree it in a blender. If necessary, thin it with additional milk or water. Season to taste with salt, if needed, and freshly ground pepper. Sort through the turnip greens and remove any that are bruised or especially tough looking, and wash them. Melt the remaining 2 tablespoons of butter in a pan, add the turnip greens, and cook them over medium heat until they are tender, about 5-10 minutes. Season with salt and pepper. Remove the cooked greens to a cutting board and chop them, roughly or fine, as you prefer; then add them to the soup and serve. Dissolve the yeast in the warm water with the salt, olive oil, and sugar. Stir in the flour in two or three additions. Once a dough has formed, turn it out onto a board dusted with flour, and knead it for several minutes, adding only enough flour to keep the dough from sticking. When the dough is smooth and shiny, set it in a lightly oiled bowl, turn it over once, cover and put it in a warm place to rise, until it is doubled in bulk, about 30-40 minutes. After the dough has risen, turn it out onto an oiled baking sheet, and pat it out about 1/2 inch thick. Toss the onion with the thyme, 2 tablespoons olive oil and salt to taste and spread out over the top of the dough, pressing lightly on the onions so that some of them sink into the dough. Let the dough rise for 20 minutes. Preheat the oven to 450F. Bake the bread in the top third of the oven for 20-30 minutes, or until the bread is nicely browned. lovely post! everything looks very yummy. beautiful pictures make me want that delicious food! I *adore* Deborah Madison, and it was the Greens cookbook that got me started too; it came out the year I graduated from college and a smart friend thought I would enjoy it. He was right! Such happy memories for you in that book! Thanks for stopping by! Let me know how you like the soup. It would be even better with freshly pulled turnips straight from your own garden, sigh! Thanks for posting this recipe. My Greens cookbook is one of my food bibles, too. Lots of memories! I stole it from my mom - a not very vegetarian friendly cook - when I got my first apartment in college. This focaccia recipe is a staple in my house, and I'm at the beach in Oregon right now, and needed it. Thanks for putting it out there! I make mine with onions, too... but in a new way. I was inspired by a recent trip with my husband to Cinque Terra in Italy, where we ate in a doorway "pizza" shop in the town of Vernazza. I had the most heavenly focaccia I've ever tasted. To try to replicate the flavor (and I think I have), I mandoline A LOT of onions, and let them curl up in a bowel with the olive oil, fresh chopped rosemary, and kosher salt. I let them sit and lose their liquid a bit, then stack them over an inch thick over the focaccia. Instead of laying out the bread in a sheet pan, I use a square cake pan now, so that the juices get trapped and carmelize the onions. It's divine!